JOIN THE CLUB AND GET INTO GOLFING! Maybe its been a lifelong ambition or you might’ve suddenly got the urge but we think that there’s no time like the present to start learning to play golf! There are many adventures to be had out on the golf course, whether you’re stuck in the rough or blasting out birdies! Many golfers will tell you that there are few feelings like that magical moment when you putt the ball into the hole for the first time! 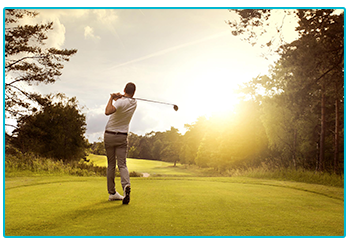 At The Insurance Emporium we believe that nothing should hold you back from your ambitions and want to help you pursue a potential passion for golf! If you’re unsure of where to start we’ve put together this guide! If you’re teeing off on your first golfing adventure, the first step that you might want to take is to find a course to play on. There are hundreds of courses around the UK that welcome new golfers looking to ‘putt’ their skills to the test on the fairway for the first time. Head to England Golf, Scottish Golf, Discover Northern Ireland and Golf Development Wales where you can search for your nearest course in the UK. Golf can have a reputation for being quite a ‘proper’ game but don’t feel intimidated when you attend for the first time! Golf is becoming a fantastically modern sport with all kinds of different players, courses and formats. The days of male-only courses are long gone and the handicap system means that players of different abilities can enjoy a round together! If you’re really unsure about attending a members-only golf club then it might be worth looking out for ‘pay and play’ courses which are often run by local councils and can be a little less formal. When you do find the right course, it might be worth asking if they do any lessons for beginners to ease you in! If you’re planning on going for the green then of ‘course’ you’re going to need some equipment! 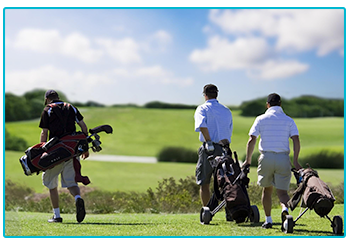 Golfing can be an expensive hobby but if you shop smartly you could find yourself saving money. Firstly, you can carry as many as 14 clubs when you’re on the course but as a beginner you probably wont need that many, showing some restraint when getting kitted out could be wise. 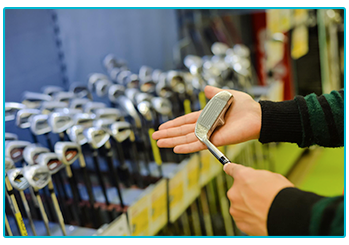 Another top tip for saving money might be to invest in some ‘pre-loved’ clubs, many golf shops stock secondhand or factory seconds at reduced prices. Whilst you’re at a golf shop it might be worth asking them for some advice picking your first set, there’s more to it than picking up any old metal stick and giving it a swing! When it comes to choosing the balls you might want to bear in mind that you’re likely to lose a few of these when you’re first learning to play! Choosing a cheap set and graduating up to the more expensive balls might be the best way to go. Much like anything that’s worth doing, you’ll probably find that you’re not naturally great at golf as soon as you pick up a club! It can take a lot of time and patience to master the sport before you start feeling like the next Rory McIlroy! Taking golf lessons could be the ideal way to improve your skills. These are widely available around the country and could be helpful if you’re looking to improve your technique. Get Into Golf is an organisation that hosts a variety of different courses from taster sessions to an improvers course, giving you plenty of options to try. The most important thing whilst you’re learning might simply be remembering to enjoy yourself and not take things too seriously! There will probably be times where you feel a little frustrated but taking your time and not wrapping a 9-iron around a tree could be vital in having a good time golfing! After you’ve found a course, bought your gear and sharpened up your skills you could be all set to play one of the most popular sports in Britain! There are numerous benefits that come with getting into golf. Firstly, you’ll often find yourself walking a good few miles around the course, maybe further depending on how often you’re in the trees! This can be great for your health, giving you cardiovascular exercise, fresh air and a dose of vitamin D if the sun is out! On top of this, it can be a great social activity where you can meet new people, play with friends or even take the family! Golf is a sport that can give you a great opportunity to get out and put the world to rights between holes! Whether you’re catching up with old friends or holding business meetings, golf is a sociable activity with enough competition to keep it exciting. What’s more, there’s often a great chance to relax at the 19th hole after a round! Once you get into the swing of golf it can open the door to a whole world of adventures on the course. If you‘ve decided to get golfing and take the plunge on a set of clubs, it might be worth getting them insured. At The Insurance Emporium, our new Golf Insurance policies all have a 20% Introductory Discount! They also have a whole host of Standard Benefits plus a range of Elective Benefits to choose from. Find out more at The Insurance Emporium! This blog is in no way sponsored, endorsed or administered by, or associated with England Golf, Scottish Golf, Discover Northern Ireland, Golf Development Wales or Get Into Golf.